In preparation for our next big adventure – looking for Big Foot in the Olympic Forest – I decided to remove the photos off our camera. It’s always a surprise to see what’s on the camera, which was taken weeks prior. Rich took pictures of Pu’Yi supervising Rachel the Raccoon as she chowed down on dog food. Rachel has been a frequent visitor for the past year or so. We can distinguish her from other, possibly hostile, raccoons by the way she delicately picks up kibbles with her paws while looking around. In addition, the cats seem to sense when it’s Rachel at the feeding trough and not another masked visitor. After a week of gnawing on turkey and fixings, I decided to vanquish the remaining turkey by making individual turkey pot pies. I chopped up carrots, celery, potatoes, onions, and garlic, and cooked them in broth until soft. I thickened with a little flour, and then added diced turkey. A dash of pepper, and some chopped sage and other herbs from our garden, completed the dish. The tops were a pastry made from white and whole wheat flour, butter (from cookie baking), minced herbs, and a splash of water. I made way too much pastry so I made a quiche (background in the picture below) with carrots, broccoli, onions, sliced chicken sausages (from freezer), and other vegetables on the verge of going bad, including some kale. I poured over the top several beaten eggs and topped with some grated cheddar cheese. 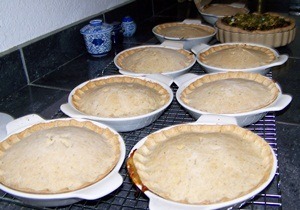 I frozen four of the pot pies. We ate four along with the quiche for the remainder of the week. In retrospect, the pot pies were super easy to make; however, I panicked and felt that they’d bubble over if I made the filling to “juicy.” In the future, I’m going to use less thickening and have faith the crust will seal in the juices. As you can see in the picture to the right, only one pot pie seeped. The twenty different cookies, mini fruitcakes, and other delectables I made during the Thanksgiving weekend were spread out on our dining room tables in early December so I could pack boxes of goodies to send to friends and family. I’ll pack more boxes and bowls this Thursday to bring to Rich’s and my families on Christmas Eve. People from California, Colorado, Hawaii, Oregon, and Washington will be spending the day at Rich’s son’s house in Camas, Washington. The following day, Christmas, Rich and I, along with the three MusCATeers (Pu’Yi, Jujube, and Zephyra), will be camping, hiking, biking, and relaxing along with Washington coast. I’m looking forward to visiting the Olympic “rain” Forest and may be snatching a peek at Big Foot!